A picture of a cute Harp Seal on the ice floe on the Gulf of St. Lawrence being watched over by Heather Mills McCartney and her husband Paul McCartney. Harp Seals are in grave danger and celebrities like Heather Mills McCartney and Paul McCartney do all they can to try and protect these cute little animals. Along with the Humane Society of the US, Paul McCartney and his wife head out to the ice floes along the Gulf of St. Lawrence to experience these animals in their natural environment. Heather and Paul McCartney try to save the Harp Seals and to show people how important their existence is before the yearly hunt begins. The seal hunt in Canada is the largest, as humans brutalize the population of Harp Seals leaving these animals close to extinction. Most of the baby seals do not even get their first solid meal or dip in the cold Arctic waters before trying to escape the slaughter. This baby Harp Seal sits upon the ice floe along the Gulf of St. Lawrence waiting for the return of its mother that is feeding in the cold Arctic waters. Nobody can turn away from the cute black eyes surrounded by white fluffy fur, even people with extremely busy lives like Paul and Heather McCartney. 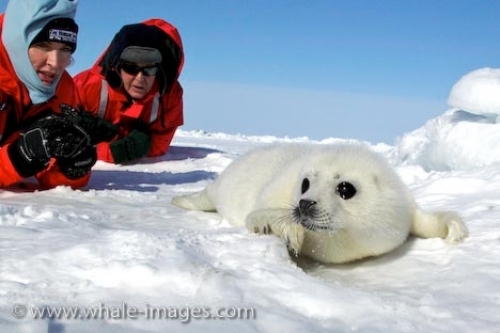 The baby Harp Seal in this picture is barely a week old as it is not long after that when their white coat becomes spotty and darker. The cold climates around the region may be felt by the McCartneys', but the Harp Seals can withstand Arctic conditions that are beyond a human's tolerance level. More people everyday are starting to boycott this seal hunt and future hopes are that the seal hunt will eventually be ended forever. How can humans be so cruel and take the lives of a baby Harp Seal before it even has a chance to explore life as they know it. Hopefully having people like Paul McCartney and his wife Heather aboard the crusade of saving the Harp Seal, that hunting seals will soon be a thing of the past.